Antigua is a charming town. Charming in the sense that everyone uses that word to describe it. Colonial, quaint and charming. But the food scene leaves much to be desired. 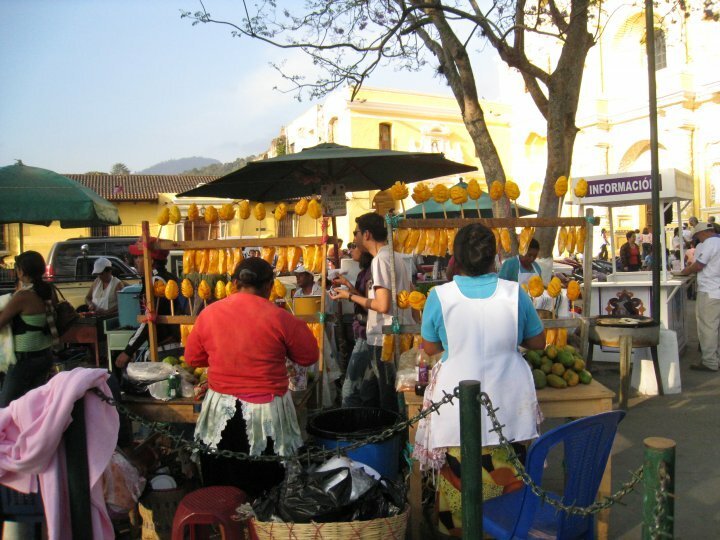 Antigua is one of the main destinations for travelers visiting Guatemala. The restaurants are aimed at the older, comfort-concerned age group. It´s a tidy city, with limited options for street food. The main square in front of the church has a few stalls selling tasty tostadas, enchiladas…and hot dogs, for the intrepid eater. A mango on a stick can be the sweet end to a light snack. But an authentic meal is hard to find. All around town, fancy restaurants serving fancy fare charge fancy prices. Italian cuisine seems to dominate, while French food seems to be another favorite contender among the purple haired tourist groups. It was daunting finding a place where only locals ate. Good thing we were tipped off by a bartender in Lake Atitlan. 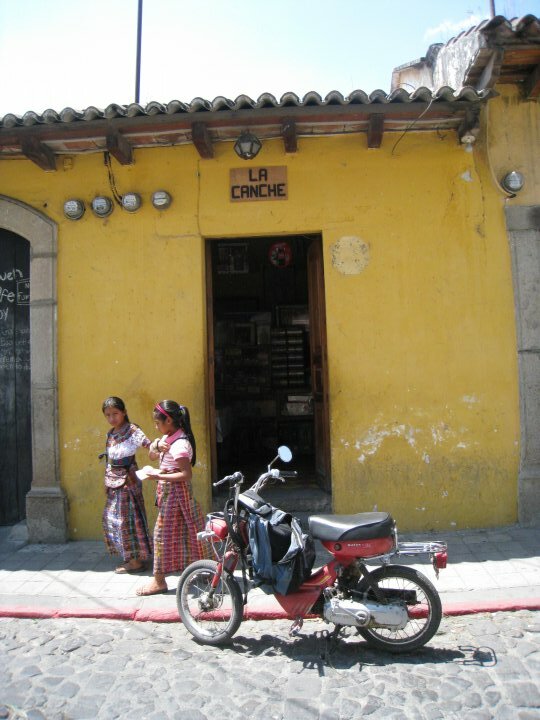 He mentioned the name of a restaurant, tucked away behind a tienda, right off the main square where one of the best meals in Antigua could be had. Irena and I popped in for lunch, anticipating a grand meal to ready us for the afternoon volcano hike. But the kitchen prep was just beginning. We watched the ladies in the back (ranging in age from teenager to shuffling grandmother) chopping green beans, peeling chayote and blending the sauce for the evening special: pollo en pipian. We thoroughly enjoyed our light lunch of guacamole, tamales and beans, but decided the real meal would be had that evening. After a strenuous and dangerous climb up an active volcano (I scraped my hand on lava rock! ), Irena and I were ready to inhale a hearty dinner. We got lost while trying to find our way back to the town center so we ended up detouring for a small pre-dinner tostada appetizer. By the time we made it back to the restaurant, we were primed and ready for the chicken that had been stewing all day long. As we entered the shop and started to make our way behind the counter, some locals looked at us wide-eyed and asked us how we knew there was a restaurant in the back?? We just looked at them and said that we´d been coming there for ages… (no matter that our first time was that morning). We plopped our rain soaked bodies down in a few chairs and waited on an order of pipian. We ordered one order, assuming that one plate would be enough for the two of us to share. But the old woman, either not hearing us, or thinking us fools for wanting to share such a luscious dish, brought us each our own bowl. Piping hot stewed chicken (specify dark meat of course), smothered in a brown sauce rich in flavor. Not a whole lot of nuance here. Garlic, chili, onion, pepper, tomato. Boom! It´s in your face, all ingredients wanting to make their appearance known first. Yet it all works in harmony, and each bite, paired with a fluffy potato, makes its way down easily. Real easy. My plate was wiped clean within minutes. 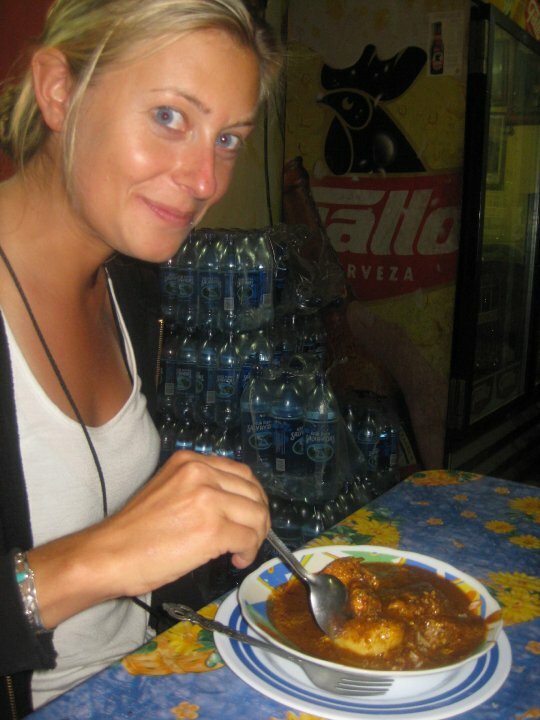 I´ll chalk that up partly to the hike, but mostly to the tastiness of the dish. 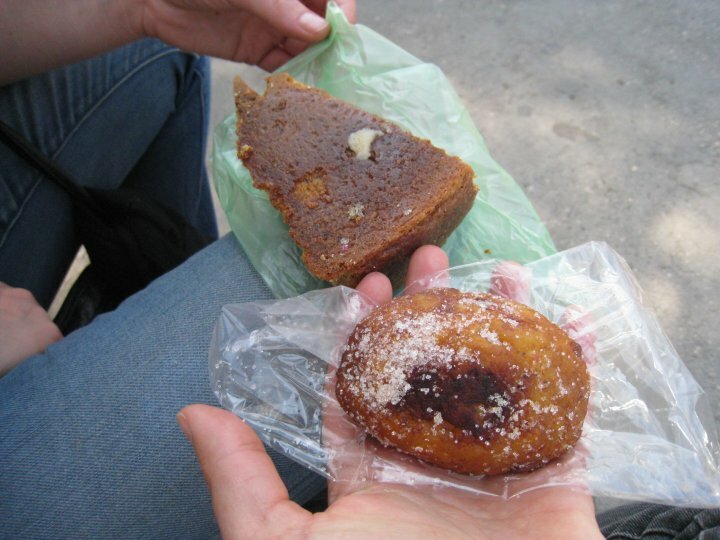 If and when you go to Antigua, search out La Cancha. Walk behind the counter as if you know what you´re doing. Real professional like. And sit down and order the special of the day. If you´re lucky, you´ll have one of the tastiest pipians in the area. And then on the way out, take a dessert from the glass case brimming with sweet confections. The plantain stuffed with frijoles is sure to satisfy (or on second thought, make that an afternoon snack. It weighs like a brick in the stomach, but it´s definitely worth trying).